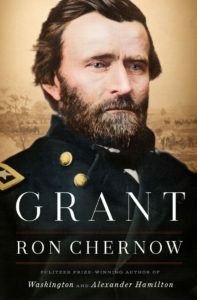 The Historical Society’s Book Club has chosen its summer reading selection: Grant, by Ron Chernow. We’ll meet to discuss the book on Tuesday September 25 at 7 pm at Greenfield Hall, giving you all summer to work through Chernow’s lengthy but captivating biography of Ulysses S. Grant. Grant was named one of the best books of 2017 by Goodreads, the New York Times, the Wall Street Journal and others. Chernow “delivers a deeply researched, everything-you-ever-wanted-to-know biography, but few readers will regret the experience,” according to Kirkus Reviews. As always, all are welcome at our discussion in September, even if you haven’t read the book. Light refreshments will be served. Looking even further ahead, the Book Club will also meet on Tuesday November 27 to discuss It Ended Badly: Thirteen of the Worst Breakups in History, by Jennifer Wright.